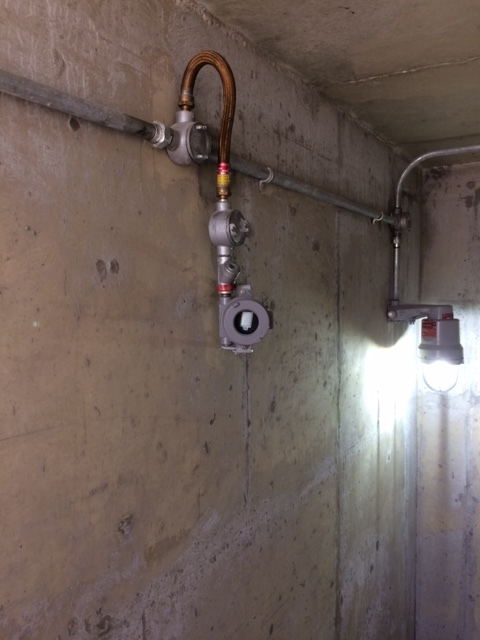 The Larson Electronics EXP-MS-N4X-AT-HV Explosion Proof motion sensor is approved Class I Divisions 1 & 2 and Class II Divisions 1 & 2 and the ability to power lights or other equipment within hazardous locations based on motion. This C1D1 rated motion sensor features adjustable sensitivity and time delay after motion. The EXP-MS-N4X-AT-HV can handle a maximum load of 400 watts. This explosion proof motion sensor is ideal for operators seeking a high quality explosion proof motion sensor rated for use in hazardous areas designated Class I Divisions 1 and Class II Division 1. 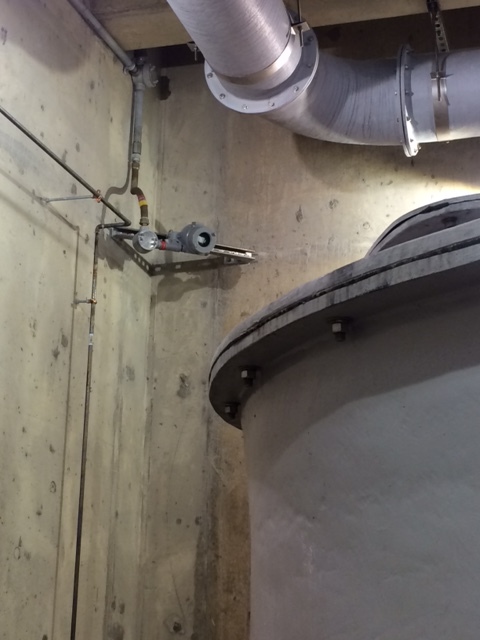 This explosion proof motion detector provides up to 15` by 15` coverage when mounted at 16`. The entire unit is constructed of copper free non-sparking aluminum construction with a glass window for motion detection. This unit is easily wall mounted via integral mounting bracket, which can be adjusted -90° to +30° vertically after installation. The explosion proof housing provides two 1/2" or 3/4" hub openings located on either side of the housing for running electrical conductors in a feed through configuration. A bushing seal at each conductor opening prevents damage to wiring insulation. This unit leverages cutting-edge microwave sensors to detect motion. When in use, the device sends out discreet waves that are reflected back from nearby walls and objects (not heat or light). Microwave sensors are not affected by line of sight, resulting in wider and more accurate coverage of the target area. By comparison, traditional infrared sensors can only detect heat and light (factors used to identify movement) within the unit’s field of view. Microwave sensors also provide stable performance in unpredictable climates and can penetrate glass, plastic and other non-metallic objects. EXP-MS-N4X-AT in operation. Click Here to view our Flex Couplers available for purchase. Reach Setting: For best results, it is recommended to adjust the motion sensitivity of the unit by configuring the reach setting. Reach is the term used to describe the radius of the circular detection zone produced on the ground. 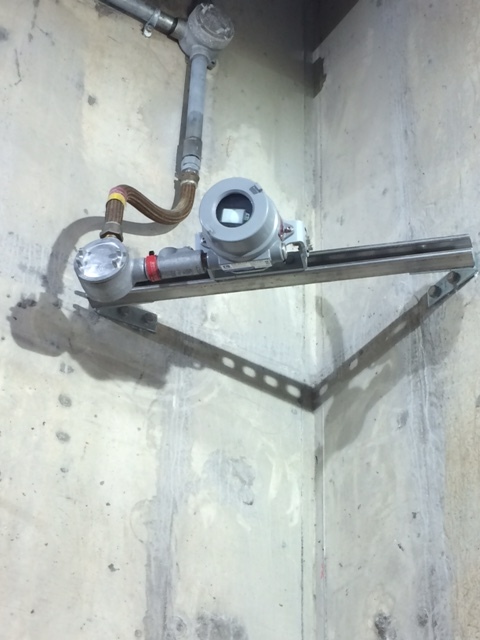 After mounting the sensor at a height of 8.2 feet, operators can adjust each control to select distance sensitivity. This detection distance is measured using a person who is between 5.2 feet and 5.5 feet tall with an average build, moving at a speed of 1.0-1.5m/sec. If any of these variables are changed, the detection distance will also change. The EXP-MS-N4X-AT-HV operates like a standard on/off light switch. The circuit is normally open when no motion is present. Once motion is detected, the internal switch changes to a closed circuit, allowing voltage to pass through the sensor and power the device(s) at the other end. This unit is designed to operate on 120V, 208V, 220V, 240V, or 277V AC electrical circuits. We also offer low voltage 12-24V AC or DC electrical systems. This motion sensor is suitable for use in environments where combustible dusts and particulates may be present. 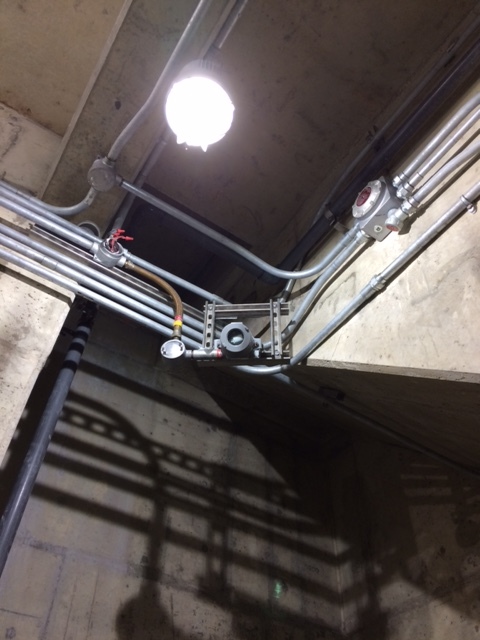 The EXP-MS-N4X-AT-HV has 1/2" or 3/4" NPT tapped conduit openings on either of the unit in feed through versions while dead end versions have a single conduit hub, providing easy and secure connection to main power line supplies.